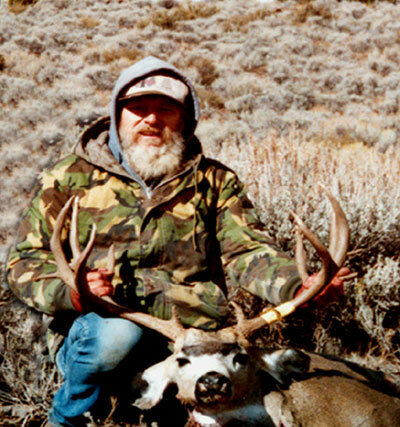 It was on the eighth day of his hunting trip during the 1997 California deer season that Bob Edwards took this buck on "NO TELL'EM RIDGE." Edwards told us, "Not many bucks were being seen. Predators were abundant. I hunted hard everyday hitting those ridgetops and rimrocks and passed on 20" class bucks nearly everyday. I took him at a distance of 275 yards with 130-grain Nosler Ballistic Tip handloads with a Remington model 721. There were two other bucks with this one. One was a high, heavy, 25-inch 3x3 and the other was a small 4x3. I took this buck one-on-one, glassing and still-hunting. He tapes out 31 inches, 7x7 with the eyeguards. His unofficial B&C gross was 188 6/8 and 174 6/8 net. Not a bad buck for California!"